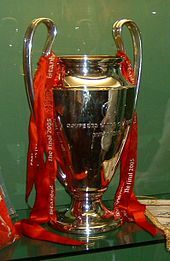 The European Cup was an association football competition contested from 1956 to 1992. Spanish manager José Villalonga Llorente led Real Madrid to success in the inaugural final in 1956 and repeated the feat the following season. English clubs and managers dominated the competition in the late 1970s and early 1980s, winning every tournament from 1977 to 1982. Despite this, Italian managers have been the most successful, winning eleven of the tournaments since 1956. The competition became the UEFA Champions League in 1992, with Belgian Raymond Goethals leading French club Marseille to success that season. Only Bob Paisley, Carlo Ancelotti and Zinedine Zidane have won the tournament on three occasions. Paisley led Liverpool to three titles in five seasons, Ancelotti won three titles and reached four finals with Milan and Real Madrid, and Zidane won three consecutive titles with Real Madrid. Seventeen other managers have won the title on two occasions. Only five managers have won the title with two clubs: Carlo Ancelotti with Real Madrid and Milan; Ernst Happel with Feyenoord in 1970 and Hamburg in 1983; Ottmar Hitzfeld with Borussia Dortmund in 1997 and Bayern Munich in 2001; José Mourinho, with Porto in 2004 and Internazionale in 2010; and Jupp Heynckes with Real Madrid in 1998 and Bayern Munich in 2013. Seven men have won the tournament both as a player and as a manager, namely Miguel Muñoz, Giovanni Trapattoni, Johan Cruyff, Carlo Ancelotti, Frank Rijkaard, Pep Guardiola and Zinedine Zidane. Carlo Ancelotti became just the second three-time winning manager when he led Real Madrid to their tenth title in 2014. He has reached a total of four finals in the UEFA Champions League. Zinedine Zidane is the only manager to have succeeded winning three consecutive titles, all with Real Madrid. Bob Paisley was the first manager to win the cup three times, all with Liverpool. Ernst Happel is the first manager to be champion with two clubs. Ottmar Hitzfeld, winning manager in 1997 and 2001. Jupp Heynckes, winning manager in 1998 and 2013. Alex Ferguson, winning manager in 1999 and 2008. Vicente del Bosque, winning manager in 2000 and 2002. José Mourinho, winning manager in 2004 and 2010. Pep Guardiola, winning manager in 2009 and 2011. This table lists the total number of titles won by managers of each country. "European Cups – Performances by Coach". Rec.Sport.Soccer Statistics Foundation. rsssf.com. 2008-02-06. Retrieved 2008-03-11. "European Champions' Cup". Rec.Sport.Soccer Statistics Foundation. rsssf.com. 2008-02-06. Retrieved 2008-03-11. ^ "History". UEFA. 2007-07-02. Retrieved 2008-03-05. ^ "Frank Rijkaard". UEFA. Archived from the original on 2008-02-05. Retrieved 2009-05-28. ^ "Josep Guardiola". UEFA. Retrieved 2009-05-28. ^ a b c d e f g h i j k l m n o p q r s t u v w x y z aa "Final facts and figures". UEFA. Retrieved 2008-03-04. ^ "Celtic adventure reaps reward". UEFA. 2006-01-01. Retrieved 2008-03-04. ^ "Charlton leads United charge". UEFA. 2006-01-01. Retrieved 2008-03-04. ^ "Feyernoord establish new order". UEFA. 2006-01-01. Retrieved 2008-03-04. ^ "Cruyff pulls the strings". UEFA. 2006-01-01. Retrieved 2008-03-04. ^ "Müller ends Bayern wait". UEFA. 2006-01-01. Retrieved 2008-03-04. ^ "Withe brings Villa glory". UEFA. 2006-01-01. Retrieved 2008-03-04. ^ "Magath thunderbolt downs Juve". UEFA. 2006-01-01. Retrieved 2008-03-04. ^ "Kennedy spot on for Liverpool". UEFA. 2006-01-01. Retrieved 2008-03-04. ^ "Football mourns Heysel victims". UEFA. 2006-01-01. Retrieved 2008-03-04. ^ "Steaua stun Barcelona". UEFA. 2006-01-01. Retrieved 2008-03-04. ^ "Futre inspires Porto triumph". UEFA. 2006-01-01. Retrieved 2008-03-04. ^ "PSV prosper from Oranje boom". UEFA. 2006-01-01. Retrieved 2008-03-04. ^ "Crvena Zvezda spot on". UEFA. 2006-01-01. Retrieved 2008-03-04. ^ "Koeman ends Barcelona's wait". UEFA. 2006-01-01. Retrieved 2008-03-04. ^ "Ex-Marseille coach Goethals dies". BBC Sport. 2004-12-06. Retrieved 2008-03-04. ^ "Massaro leads Milan rout". UEFA. 2006-01-01. Retrieved 2008-03-04. ^ "Kluivert strikes late for Ajax". UEFA. 2006-01-01. Retrieved 2008-03-04. ^ "Juve hold their nerve". UEFA. 2006-01-01. Retrieved 2008-03-04. ^ "Seventh heaven for Madrid". UEFA. 2006-01-01. Retrieved 2008-03-04. ^ "Solskjaer answers United's prayers". UEFA. 2006-01-01. Retrieved 2008-03-04. ^ "Shevchenko spot on for Milan". UEFA. 2006-01-01. Retrieved 2008-03-04. ^ "Porto pull off biggest surprise". UEFA. 2006-01-01. Retrieved 2008-03-04. ^ "Liverpool belief defies Milan". UEFA. 2006-01-01. Retrieved 2008-03-04. ^ "Ronaldinho delivers for Barça". UEFA. 2006-06-01. Retrieved 2008-03-04. ^ "Milan avenge Liverpool defeat". UEFA. 2007-07-18. Retrieved 2008-03-04. ^ "United strike gold in shoot out". UEFA. 2008-05-22. Retrieved 2008-05-22. ^ "Stylish Barcelona take United's crown". UEFA. 2009-05-27. Retrieved 2009-05-27. ^ "Live - Champions League final". BBC Sport. 2010-05-22. Retrieved 2010-05-22. ^ "Barça crowned as Messi and Villa see off United". UEFA. 2011-05-28. Retrieved 2011-05-28. ^ "MATCH REPORT: BAYERN MUNICH 1 CHELSEA 1 (3-4 ON PENS)". 2012-05-19. ^ "Super Bayern crowned champions of Europe". FC Bayern Munich AG. 2013-05-25. Retrieved 2013-05-26. ^ "Madrid finally fulfil Décima dream". UEFA. 2014-05-24. Retrieved 2014-04-25. ^ "Barcelona claim fifth crown". UEFA. 2016-01-27. Retrieved 2016-05-28. ^ "Zidane proud after Real Madrid penalties win". UEFA. 29 May 2016. Retrieved 29 May 2016. ^ "Zidane completes player/coach double double". UEFA. 4 June 2017. Retrieved 5 June 2017. ^ "Zidane reaches more milestones in Kyiv". UEFA. 26 May 2018. Retrieved 27 May 2018.